Prompt & Efficent Removal of All Your Waste. Call Now for a Price & Service Second to None! As the year gets older, chances are your junk pile is growing! It can be easier to accumulate extra trash when you already have an excess. Having a proper clean up can often give you the motivation needed to keep your house/property looking tidy. Sometimes, however, it can be hard to take that first step. The number of trips that would be needed to take it all to a tip may be overwhelming and you don’t want to have a skip sitting in your front yard while you find the time to fill it. Same-Day Rubbish Removal is here to solve all these problems. Let us do the heavy lifting, just direct our friendly team to what items need to be taken away. Call us now on 0402 737 046 for a great quote on your Castle Hill property, we can solve your rubbish problem today! There are approximately 4 million computers and 2 million TVs bought in Australia every year. Currently around 88% of these will end up in landfill! This isn’t even half the problem though, other electronic waste includes telephones, fax machines, printers, DVD players, radios, etc. All of those items help make up about half of the e-waste in Australia. The other half comes from other electrical equipment such as refrigerators, washing machines, dryers, dishwashers, air-conditioners, vacuum cleaners, etc. 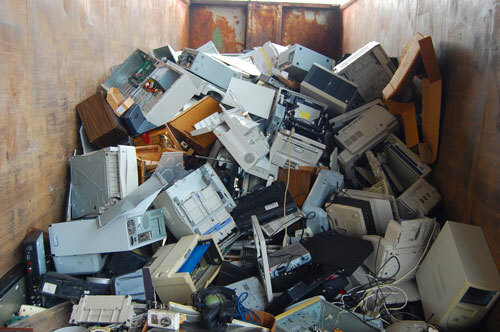 Worldwide, there are around 40 million tonnes of electronic waste produced every year. Australia and the rest of the world need to try and dispose of our garbage more responsibly. The team at Same-Day Rubbish Removal are careful to ensure that they dispose of your home or office junk in a responsible way, while providing an affordable and convenient service to your Castle Hill location. Over many years of experience in Sydney, Same-Day Rubbish Removal have been able to optimize their junk removal service, giving you an easy experience, while not hurting your pocket like other junk removal options. Instead of you having to do multiple loads to the nearest recycling and waste management centre, or paying for the delivery and pickup of a skip bin, Same-Day Rubbish Removal do everything in one go. Our friendly and experienced team will do all the heavy lifting for you and make sure your home or business is left looking spotless. In addition to Castle Hill, we service all surrounding Hills District suburbs including Baulkham Hills, Pennant Hills, Kellyville, etc. Don’t wait any longer, get a free quote now by calling 0402 737 046. You won’t be disappointed! The Same-Day Rubbish Removal team look forward to helping you solve your waste problem. Sitting West of Castle Hill, Kelly is a prominent, highly populated suburb. With around 28,000 residents, Kellyville is one of the Hills District’s popular areas. Being a fair way out of the city, it’s not a quick drive to Sydney’s CBD, and some Sydney services don’t like to travel out this far. If you need a rubbish removal service, our team will happily come to you, in fact, we’ve got a team nearby and ready to serve. You won’t find a cheaper, faster or easier junk disposal in the Kellyville area, so give us a call today – we look forward to hearing from you! Surrounded by Kellyville, there are many reasons someone my like to set up a home or business in Beaumont Hills. Not having a trainline is one complaint people have about the area, but this is certainly made up for with a great number of bus services. Unfortunately, buses don’t take away rubbish either, so you will need to look for alterative solutions if you’ve got junk that needs to go. Same-Day Rubbish Removal offer a prompt service for the best value in Beamont Hills, so you can’t go wrong! Give our friendly team a call today on 0402 737 046. Previously being a part of the suburb of Kellyville, The Ponds has only been a separate suburb since 2007. It may sound like it is made up of ponds, but it’s actually named after a nearby creek – Second Ponds Creek. Interestingly, The Ponds has the highest percentage of married people in Australia with 71.5% of the over 15 population being married. It could be assumed that majority of this area is made of families, and families almost always generate a significant amount of rubbish. That is why Same-Day Rubbish Removal exist, to help out families and those who need fast and cheap rubbish removal. Give us a call today and we can have your home in The Ponds cleaned up in no time!